Rovers unbeaten away run was extended to eight games, after they played out a thrilling 2-2 draw at Home Park on Saturday afternoon. Tom Nichols went close for the visitors when he saw his close-range effort somehow saved by keeper Matt Macey just prior to the break, before Rueben Lameiras scored the opening goal five minutes into the second half. Jonson Clarke-Harris then produced another moment of magic midway 20 minutes later to draw the scores level, rifling an excellent 25-yard strike into the top corner, but Argyle quickly restored their lead as Tony Craig put the ball in his own net. Gavin Reilly came on late in the game and did precisely what was wanted of him, as he glanced home James’ Clarke’s cross in stoppage time right in front of the 1,200 Rovers fans. Graham Coughlan made two changes upon his return to Argyle. 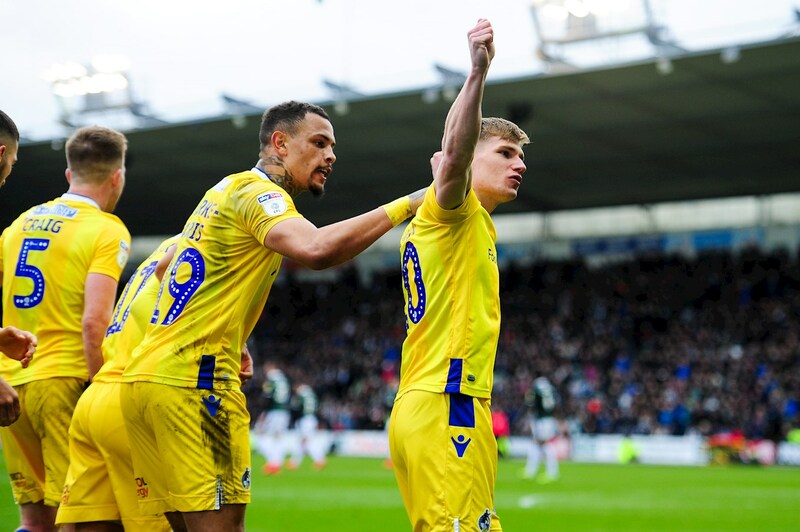 The headline change was the inclusion of Alfie Kilgour at the heart of the defence, as the youngster made his full EFL debut in the absence of captain Tom Lockyer. Tareiq Holmes-Dennis also returned to the starting line up, as he slotted back into the left side of the back four at the expense of Michael Kelly. Ollie Clarke wore the armband with Lockyer away on international duty. Despite a quarter of Home Park missing, with the Mayflower Stand hollowed out as it awaits redevelopment, the atmosphere down in Devon begun with electricity; much of which was generated by the 1,200+ travelling Gasheads. The same however could not be said for the opening 10 minutes on the pitch, with the solitary point that separated the two sides going into the encounter, very apparent as both outfits wrestled for supremacy. A third of the way through the first half and the game had its first chance, as Argyle striker Freddie Ladapo drove through the centre, twisting and turning before getting to the edge of the box and dragging a low shot towards the corner, but Jack Bonham did very well to get down to his left and tip it round the post. That sparked a promising period for the hosts as they went in search of the opener, this time nice play from Jamie Ness teed up Rueben Lameiras on the cusp of the penalty area, however he didn’t connect as he would like and his effort deflected away from danger. Rovers had to wait until the half-hour mark to get their first real sight of goal, when James Clarke got down the right flank and delivered a useful cross to the near post that Tom Nichols headed well, but it sailed a few inches wide of the post. Shortly after, Ladapo should really have put Plymouth in front, when Joe Riley fired a low ball across goal with the striker free and two-yards out at the back post, but he failed to connect with the ball and was left with his head in his hands. At the other end, Ed Upson clipped in a decent free kick to the back post that Craig got up well to meet and knock into the six-yard box, as Jonson Clarke-Harris almost got on the end of it to turn home. Craig was again active from the resulting corner, drifting in central from deep to meet Liam Sercombe’s delivery, but his header was off target. The 34-year old kept busy, but this time in his own half, throwing himself excellently in front of Lameiras decent strike from the edge of the box. Just on the stroke of half-time, Rovers were denied by a save of the season contender for the second week running, as O.Clarke clipped in a great ball at the back post for Nichols, who met it two-yards out only to see the keeper somehow bat it away, meaning we went into the break level. Argyle came strongest out the traps following the interval, with Ness letting a decent effort fly that deflected just over the bar and Antoni Sarcevic on the end of an important clattering from Craig. The early pressure told however on 51 minutes, when Lameiras went at Rovers down the right flank before cutting on to his favoured left foot and behind the ball beyond Bonham and into the far corner. Lameiras, the standout threat in the Plymouth ranks, continued to cause trouble on the right side and dug out a good cross to the back post that Sarcevic very nearly got on the end of. 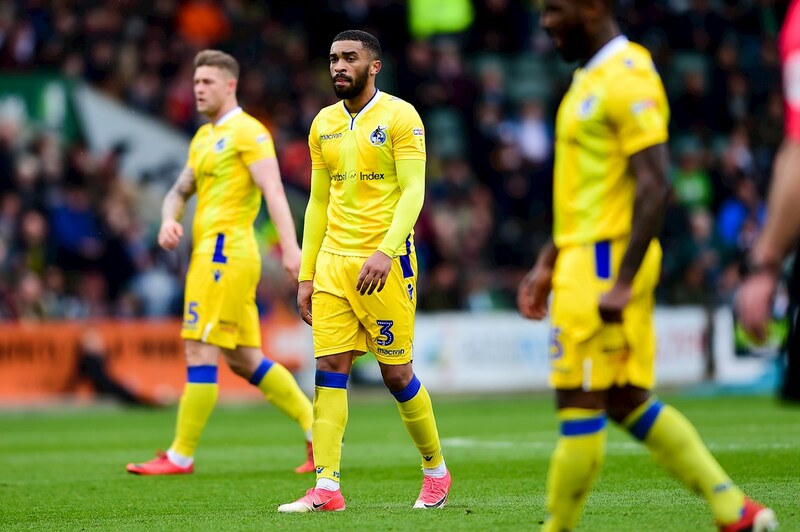 Opportunities were at a premium in-form frontman Clarke-Harris, but he did get half a chance on the hour as a cross came to him 12 yards out, he struck on his right foot but it lacked power and the keeper held it comfortably. With a little over 20 minutes left on the clock, Coughlan made his first switch as Alex Jakubiak came on in place of Nichols in a straight swap alongside Clarke-Harris. Not long after the substitution, the scores were level and there were no prizes for guessing who came up with the goods. 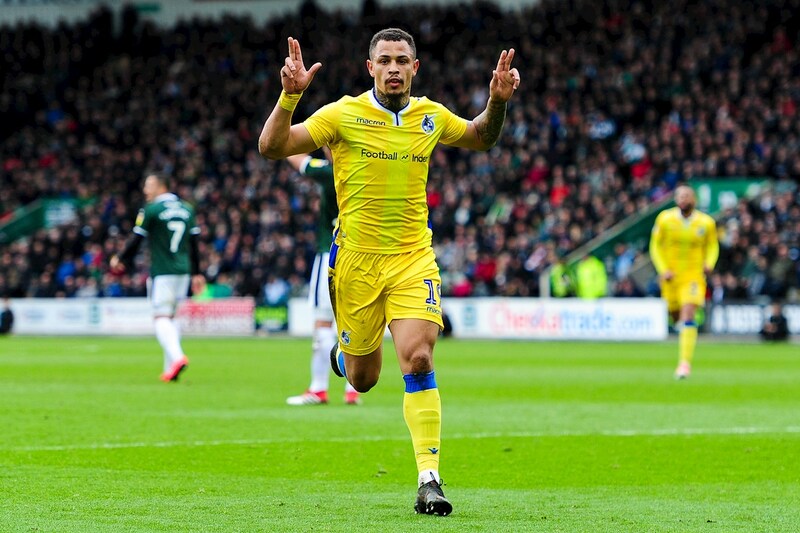 Clarke-Harris picked up the ball centrally about 30 yards out before driving into space, looking up and picking out the top corner with another exquisite strike as the striker as netted his seventh goal in his last seven league games. It was short-lived however, as Argyle retook the lead just three minutes later, as a slice of luck saw Craig accidentally turn Lameiras cross into his own net. As we entered the closing 10 minutes, a decent change went begging for Jakubiak as a cross dropped to him inside the area, he met it strongly on his left foot but it sailed just over the bar. With five minutes remaining, Rovers made another change in a bid to increase their attacking threat, as Gavin Reilly replaced Abu Ogogo – a change that paid dividends in stoppage. The Gas was pressing for their second equaliser and found it in stoppage time, when J.Clarke’s curling delivery was met by the faintest of touches by Reilly to guide it beyond the keeper and spark wild celebrations right in front of the away fans – a thrilling end to a thrilling game. Rovers XI: Jack Bonham (GK), James Clarke, Alfie Kilgour, Tony Craig, Tareiq Holmes-Dennis, Ed Upson, Ollie Clarke, Abu Ogogo (Gavin Reilly, 85′), Liam Sercombe, Tom Nichols (Alex Jakubiak, 67′), Jonson Clarke-Harris. Unused Substitutes: Adam Smith (GK), Michael Kelly, Joe Partington, Chris Lines, Stuart Sinclair. Plymouth XI: Matt Macey, Joe Riley (Oscar Threlkeld 62′), Ryan Edwards, Niall Canavan, Gary Sawyer (C), Yann Songo’o, David Fox, Antoni Sarcevic, Jamie Ness, Ruben Lamerias, Freddie Ladapo. Unused Substitutes: Kyle Letheren (GK), Ryan Taylor, Paul Anderson, Lloyd Jones, Ashley Smith-Brown, Alex Fletcher.